Six years ago things happened in Egypt that changed much of how we saw ourselves and how others saw us. All of a sudden with the alleged Arab Spring in early 2011, the eyes of the world were on Egypt and other countries in the Middle East. To say that things didn't exactly work out as planned or hoped (since there really wasn't much planning involved in the events of 2011 and the following years) would probably be the understatement of the century. At the time of the unrest my children asked me politely but very forcefully to stop blogging for a while. I like my children and I could understand their concern (like if I got deported I would be driving them out of their minds) so I went along with it. Meanwhile I was trying to make sense of the political activity in the area and was doing a lot of research with journalists on Twitter and other forums, and I was sharing that information on Facebook for friends of mine who had lived in Egypt, visited in Egypt, or who were just interested in Egypt. My Facebook feed turned into a news service of sorts where odd bits of information are shared with the world about life in the Middle East. That was the original goal of Living In Egypt, after all, to give people outside the country an idea of what it was like to actually live here. But after six years of mostly doing the news, life has changed again in Egypt and I've decided that it is important to document this change. My farm went into the Arab Spring period as a place where people came to do equestrian tourism. We had visitors from abroad who would come to stay for a week or so in Egypt and would ride our horses seeing Egypt very much up close and personal. Immediately after the uprising in 2011 we still had a few visitors but the numbers fell quickly to nothing. This was, to say the least, a very difficult period. Not only were there no visitors from abroad but many companies, embassies, and schools in Cairo were extremely nervous about their people even traveling around the city, fears that most of us living here found quite baseless...but no one was asking us. Financially we managed, but for me the most difficult issue was how to keep a group of bright young men occupied while most of our work languished. The opportunity came up with The Donkey Sanctuary to have them trained as farriers and vet assistants, so I decided that if they weren't working much, they might as well learn. At first they were reluctant, but realising over time that they had real skills and knowledge was a powerful push for them to learn more. These were young men who had never finished primary school, having been told that they weren't smart enough...but it was not the case at all. In 2011 we began a goat breeding project at the farm to add the characteristics of some European and Middle Eastern goats to the local baladi Egyptian goats to improve the production of both milk and meat. We are now on about our third or fourth generation and our herd is a mix of Syrian, Saanen, Alpine, Nubian, and Boer goats along with the baladi base, which is important for its hardiness. We have since branched out into breeding Sudanese sheep, which are a short-haired sheep that give very nice milk for cheese. During a period of serious power cuts in 2012 we began looking at improving the viability of electricity and water at the farm. There is no provision for water supplies out here in the countryside and the electricity is somewhat eccentric to say the least. We arranged to dig a new 40 meter well closer to the animal paddocks than the original 20 meter well behind the house and I contacted a friend of my children's who had come back to Egypt to work in the alternative energy field about installing solar power. That began a four year project to gradually provide solar power to the farm and to ensure that we had sufficient water supplied for all the animals and our growing agricultural projects. With all of these projects going on, we also started an initiative to provide free veterinary care to the local farmers who were becoming increasingly harmed by the inflation in gas, electricity and medical costs. Vets work with us and most of our work is caring for wounds and doing maintenance on the farm animals to teach the farmers that it is easier to keep their animals healthy than it is to fix them when they are broken. Even with the demise of tourism in the Cairo area, we were keeping fairly busy, and once the panic over security dropped we found a new source of income and visitors in the schools and families from Cairo who wanted to come to the farm to learn about animals, plants, farming...or just to take a nap under a mango tree. With the general stress level for Cairenes increasing as well, a quiet spot for relaxing in a green space has been very appreciated. So living in Egypt has definitely become a new game. We are dealing with ferocious inflation here, insecurity about what is going on in the region in general, disillusionment with the hoped for social changes in the country, and concern for what will come next. The political sphere is ephemeral and uncontrollable it would seem, so I see no point in commenting on that. Here at Al Sorat Farm we are concentrating on doing agricultural research and development introducing new varieties of vegetables which we grow organically (one of the contributions of the many horses and other livestock at the farm) and then harvest seed to provide seedlings to other growers. We are experimenting with goat, sheep and buffalo cheese. We have increased our selection of unusual trees with lychee, longan, pecan, neem, karob, and sapodilla trees in the garden. So the focus in the blog is going to narrow a bit to life on the farm and our activities here. This is only appropriate since as I approach my seventies, I am less and less interested in subjecting myself to the craziness of Cairo traffic, the crowding and the pollution, and all the other urban problems. 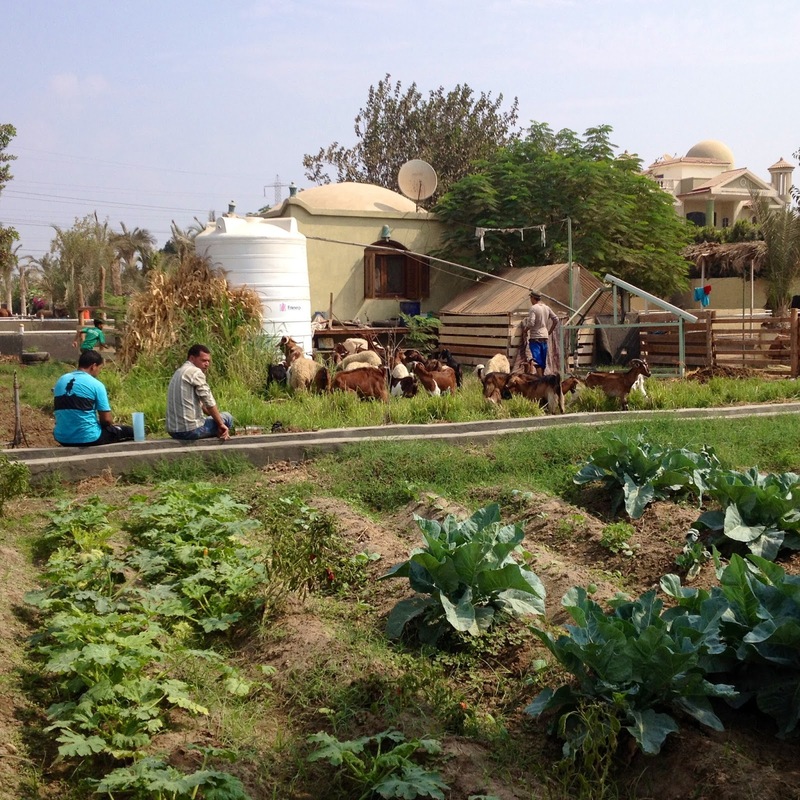 This blog has always been about my life in Egypt and these days it is more about plants, animals, and people in the countryside. For old readers, I hope that you enjoy my posts, while for new ones, I hope that they give you an insight into another lifestyle.